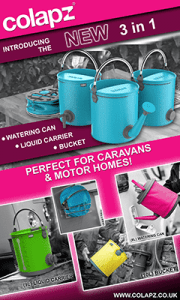 The online Website for the Caravan & Motorhome Enthusiast. One of the most enjoyable times for me in the caravan is meal times, it’s funny how at home this becomes a chore, trying to think of things to cook everyday to keep everyone happy. But when we are away it’s so different. There’s no “I don’t want that; can I have or yuck” we simply seem to agree on what we want to eat. When we first got our van two years ago, we purchased a Cadac Safari Chef, one of the little ones, when we got it its was simply to do barbeques on, you know good old burgers and sausages, nothing fancy here! We used it happily for the first year and loved it. However, we never used it to its full potential. Then last year a friend of ours did a vlog the Trudgians showing what he cooked on his larger Cadac and it looked fantastic. Now hubby had been nagging me for some time about getting the larger Cadac, but I had always shot him down, saying we didn’t need a larger one, and that ours was just fine. In fact, if memory serves me I think he wanted the larger model when we first bought it, but I felt that the smaller one would serve us. After seeing Dan’s Vlog, I had rapidly changed my mind, I had never thought of cooking the sorts of food that he had cooked. So, a couple of weeks later we went out and bought the Larger Carri Chef. Well we have never looked back. Every time we go away we use it, in fact I would say we cook almost all our meals on it now, even the obligatory fry up is done on it, including the fried eggs. But possibly my favourite meal so far has to be the pan-fried Mediterranean veg, with chicken goujons in a garlic and herb marinade. It was so simple, just pick the veg you like, we had corn on the cobs, courgette, red onion, peppers and mushrooms, spray with a little olive oil and bung on the hot plate. With the chicken, we simply covered with the marinade and left it for about half an hour then when ready, spray a little oil onto the hot plate and bung the chicken on, turning occasionally to ensure they cook right through. Then serve with potatoes of your choice. We cheated here and got some pre-prepared ones, so just had to bung in the oven. I have never seen plates cleared quite so quickly, nothing left for the big fluffy pooch this time. It doesn’t have to stop there, its possibly the most universal cooker I have ever used. 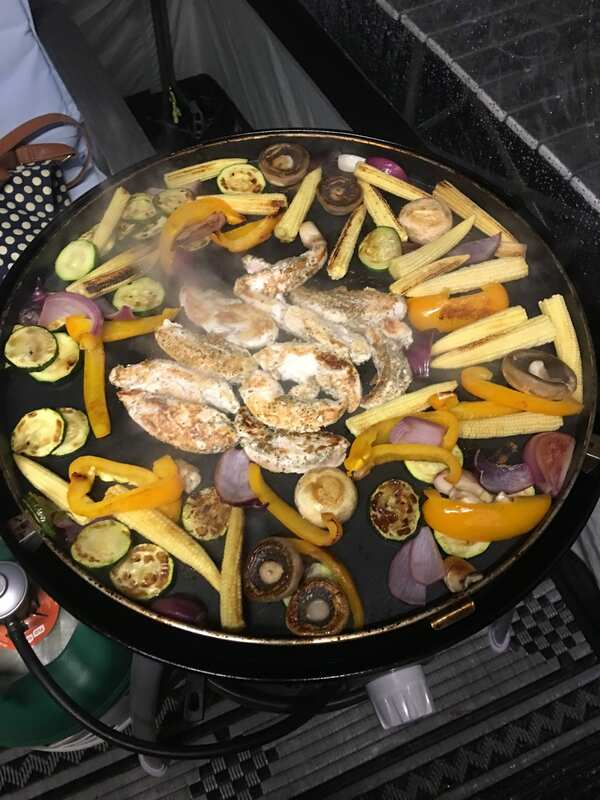 I can’t wait to use it again on our next trip, thinking of trying out the paella pan, just have to convince hubby as he is not a big fish fan, but I’m sure if its cooked on the Cadac he will love it.